MANILA, Philippines – There is no doubt that the brawl between Gilas Pilipinas and Australia last Monday in Bulacan put Philippine basketball in a bad light. FIBA has announced an investigation in the wake of the melee, which made headlines worldwide. Both Australia and the Philippines are waiting on sanctions, even as players from both sides offered their apologies for the incident. For its part, the Samahang Basketbol ng Pilipinas (SBP) has vowed to review the entire incident "comprehensively." "We will not condone violence in sports," SBP president Al Panlilio said in a Sports Center interview Tuesday night. There are concerns that the controversial brawl will impact the Philippines' hosting of the 2023 FIBA Basketball World Cup, especially as the chief executive of Basketball Australia stressed that they will need "assurances" from the SBP and FIBA regarding the safety and security of their team. Panlilio is hopeful that the incident will have no effect on the country's hosting, however. The Philippines will co-host the World Cup together with Indonesia and Japan. "Honestly, this is a standalone incident," said Panlilio, who is counting on their good relationship with FIBA to smooth out any concerns that stemmed from the brawl. "We have done a lot for FIBA as a federation also," he pointed out. "We have worked very closely with FIBA all these years, and of course, our chairman emeritus, MVP (Manny V. Pangilinan), is a part of the central board." "We worked closely also with the board. 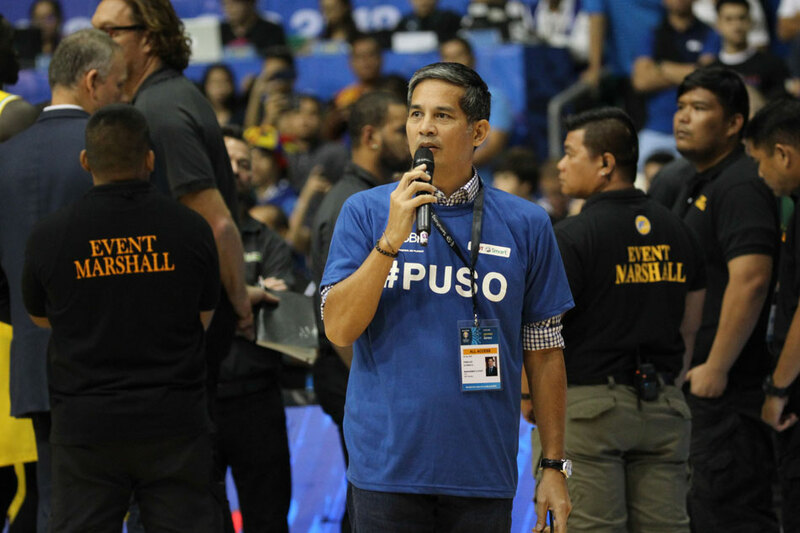 We worked very hard to win the hosting in 2023, so I hope it doesn't affect that hosting, and we will continue to prepare for that hosting," Panlilio added. The Philippines, together with Japan and Indonesia, were awarded hosting rights in December, a decision that sparked celebrations in the basketball-crazy country. In Australia, however, there are already calls to strip the Philippines of hosting rights. In a strongly worded article, Greg Davis of the Courier-Mail declared that the Philippines "needed to be kicked out of the World Cup qualifying process, for starters." "The Philippines' hosting rights for the 2023 FIBA World Cup also need to be seriously questioned," he wrote. "How can they host the game's peak event outside the Olympics, if they cannot guarantee the safety of the players?" "They can't. They have no credibility. They cannot control their own team, let alone a crowd," he added. "They should be stripped of the 2023 World Cup." The qualifier between Gilas Pilipinas and Australia was an ill-tempered affair that had been fraught with tension since the warm-ups. It reached a boiling point with four minutes left in the third quarter when Gilas guard Roger Pogoy tagged Australia's Chris Goulding with a hard foul. Australian big man Daniel Kickert responded by elbowing Pogoy – a move he admits was an overreaction – and the Filipino player crashed to the court. The situation escalated from there, with virtually the entire Gilas team rushing to the court. Goulding arguably had it the worst, as several members of the Philippine team pounced upon him at the sidelines. Another Australian player, Nathan Sobey, was hit by a chair. It took 30 minutes for game officials to decide on sanctions. In the lull, the crowd got involved, prompting Panlilio to appeal for calm. Ultimately, 13 players were ejected, and the game was stopped with 1:57 left in the third quarter as Gilas was left with just one man – Baser Amer. The result put Australia at the top spot in Group B with its 5-1 slate, while the Philippines settled for second place at 4-2. Both teams have already qualified to the second round of the World Cup Asian qualifiers.